You are here: Home / artist to artist / What’s the Essence of a Portrait? What’s the Essence of a Portrait? We’ve been asking artists about issues they encounter in their work, and recently, we asked three artists exhibiting in Portraits at Drive-By Gallery (3/1-4/7): What’s the most essential element you try to capture in your portraiture? To capture what is felt, as well as what is seen. 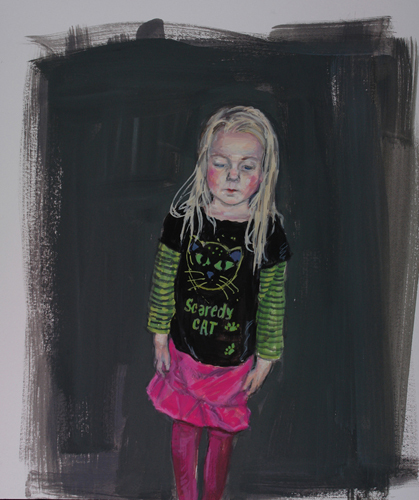 Each one of my portrait paintings is a personal journey that explores the humanity that is all around me. I am especially drawn to the youngest and oldest persons. I lose myself in either their primal exuberance or the still waters of their wisdom and fortitude. My need to paint is driven by my need to see these subjects clearly. However, like a mirage it often disappears upon completion and I strike out to do it all over again. I don’t always think about my drawings first and foremost as portraits, but as in the case of this show, it is an interesting way to frame them. By using my husband and myself as figures in the work, I root my investigations about relationships and interactions with the larger world in personal experience, within the bodies that I know best. As portraits/self-portraits, I am always seeking to capture the right expressions and particularities of our bodies. 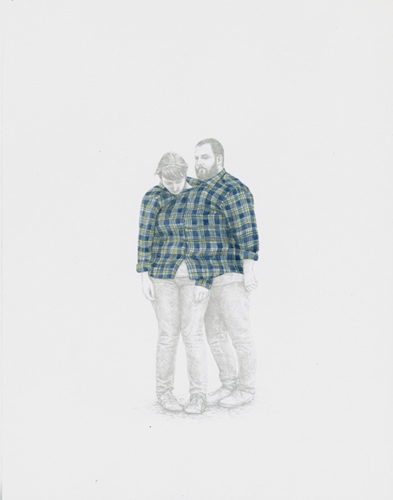 But in many ways, I see these drawings as functioning more as a portrait of a relationship, rather than of individuals. They are about a kind of balance and negotiation that comes with intimacy and closeness. I hope they can speak to more than just our particular relationship, to the struggle inherent to any relationship: the desire for, and impossibility of a complete connection with another. So in effect, these portraits/figures have the potential to be inhabited by other bodies. Because ultimately, what is it that we look for in a portrait? Some mysterious, ambiguous aspect of that person, made visible in the rendering of their face? Perhaps also some kind of recognition of a bit of ourselves as well, of the things that connect us and of what we share in common? I explore the layers and complexities of femininity, physical beauty, and the reality and imagination inherent in this realm. The lives, rituals, and introspective moments of myself and my friends are an integral part of the subject matter. Read part two of this post, where we pose the same question to a photographer, a filmmaker, and a composer. Images: Laura Chasman, DOSALENA (2012), gouache on museum mounting board; Andrea Sherrill Evans, PLAID SHIRT #4 (2011), silverpoint and watercolor on prepared paper, 14×11 in; Helena Wurzel, SHE’S GOT LIGHT IN HER EYES (2012) Oil on Canvas, 12×16 in. 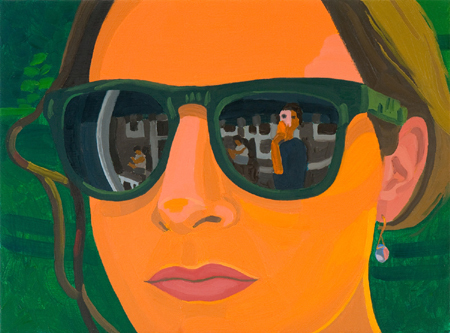 Portraits, an exhibition of work by these three artists, can be seen at Drive-By Gallery in Watertown March 1 – April 7, 2012. Helena also has a show (One Is Always Forgotten, with Ariel Freiberg) at Laconia Gallery (3/2-4/22). I ask the women who sit for my portraits to bring fabric that has a significant meaning to them. One brought a deceased relative’s shirt and one an old baby blanket while others have brought woven hammocks and a scarf from a country they were forced to leave. Before the photograph is taken I ask the sitter to wrap the fabric around their hair, completely covering it. This use of the material helps to eliminate the sitters anxiety over their appearance, granting the sitter time to think about the sensory experience of the fabric, and permitting me to photograph that memory connection. Checked out your photographs – fascinating. I love the element of self-portraiture your subjects bring to the process, by choosing the fabrics. A layered portrait (so to speak).